Nigeria's Bobsled Team Makes Olympic History. What's The Reaction In Nigerians? : Goats and Soda Well, maybe not quite as excited as the U.S. seems to be. So How Excited Is Nigeria About Its History-Making Women's Bobsled Team? Seun Adigun (right) and Akuoma Omeoga, from the Nigerian women's bobsled team, wave after an Olympic heat on February 20. Before my homeland of Nigeria entered a women's bobsled team in the Winter Olympics, I had no idea what a bobsled even was. And I definitely know about the team. The three members are Americans born to Nigerian parents. Their unlikely quest has been featured on CNN and the BBC and in The New York Times. They've danced on The Ellen DeGeneres Show. 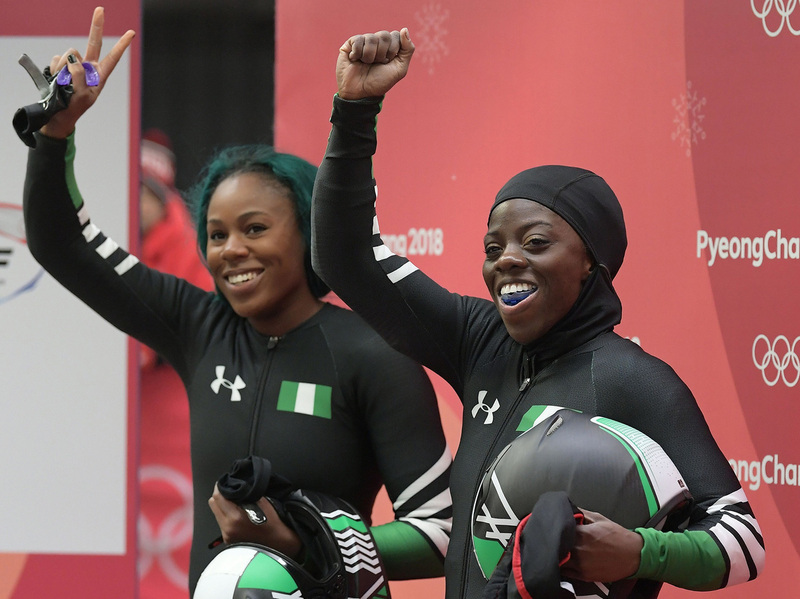 "This is a huge milestone for sports in Nigeria," 31-year-old Seun Adigun, the bobsled team driver and leader, told KweséESPN after the team qualified for the Olympics last November. "Nothing makes me prouder than to know that I can play a small role in creating opportunities for winter sports to take place in Nigeria." But what about the level of enthusiasm in Nigeria itself? "Outside social media, the excitement is basically zero," Lagos-based writer Emmanuel Dairo tells me. "Very few even know there is a winter games going on, and even fewer care. None of those I've interacted with, online or off, have mentioned the Nigerian team, never mind the Winter Games, even once." "In this part of the world, football is almost everything," says Victor Agi, a public relations practitioner in Nigeria's capital, Abuja. "Few people actually give much attention to these mostly Western-oriented games. Our weather for instance doesn't support the winter [sports]." Team captain Seun Adigun of Nigeria (right) starts a run at the Olympic Sliding Centre. Nigeria is one of eight Africa countries participating at the games in Pyeongchang, the biggest delegation from the continent at a single Winter Olympics. 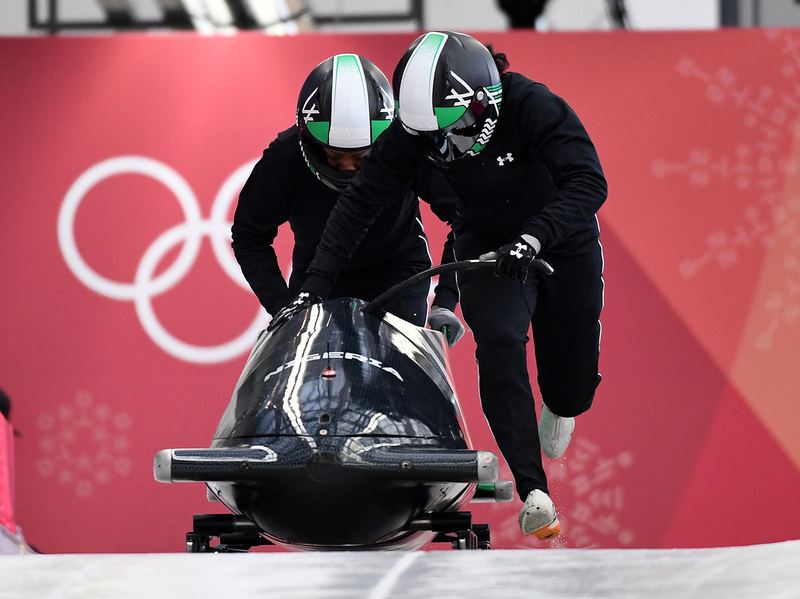 Nigeria has sent its first winter team to these games – and the first bobsled team ever from Africa: The trio of Seun Adigun, Ngozi Onwumere and Akuoma Omeoga. The three bobsledders are all runners as well. Adigun, the captain, is no stranger to the Olympics. She represented Nigeria at the 2012 London games in the 100-meter hurdles. In an interview she gave to The New York Times, she says, "In 2014, I watched bobsled for the first time to cheer for friends. I thought, Hmm, I'm getting a little bit of this Olympic fever again." She went to tryouts, did nicely and had the idea of forming the first bobsled team from an African country to go to the Olympics. She set up a GoFundMe campaign in November 2016 to fund her dream. Within 14 months, she raised $150,000, which was covered participation fees, training gears and ice time for practice and also went to establish the first-ever Bobsled & Skeleton Federation of Nigeria to increase awareness about Winter Games and inspire "a level of pride" for people across the continent. Adigun and her teammates (who alternate as breakmen) are making a big splash in the United States and around the world. They have been signed up by several brands, including Visa, Under Armour, Beats by Dre, Nigerian Breweries and Belgium-headquartered Lazer Sports, the world's oldest brand of sport helmets. "Our objective now is to be the best representation of Africa that the Winter Olympics have ever witnessed," Adigun has said. Will young Nigerians want to follow in their sled tracks? I asked Lolade Adewuyi, former editor of the football website Goal.com Nigeria, to weigh in. Adewuyi feels the team's participation in the Olympics would inspire Nigerians living in colder countries to "dream of representing their parents' country" in the Winter Olympics. "There's now a precedent [and] that is also backed by the creation of the first winter sports federation," Adewuyi, a 2016 Vladimir Potanin Fellow at the Russian International Olympic University in Sochi, told NPR's Goats and Soda blog. But then there are those skeptics. Chiemela Chike, a senior at the University of Nigeria, got to know about the female bobsledders when she stumbled upon their photos on Facebook and Instagram with "detailed captions" describing their historic outing in the Olympics. "They are greatly celebrated," Chike says. She quickly adds that bobsled was meant for "cold regions, [so] it's un-African." "Bobsleigh is foreign to the African soil," says the 19-year-old journalism student. "I don't have any idea on this [game], to be sincere," says James Ojo, a 25-year-old fan of the Manchester United soccer team. "It's kind of strange." Though she knows a man who likes the team and revels in "the fact that Nigeria was making history," Chike says there was no intense enthusiasm about the Nigerian female team in the southeastern Nigerian town of Nsukka where she's living. "I haven't heard anyone around me talking about the [bobsled] game," she adds. Neither has Agi, who works with the Nigerian Institute of Public Relations in Abuja. He says bobsled "is not so popular in this part of the world" but admits "the success of the team in the Olympics will determine how much of attention people will give the team and the game eventually." Adewuyi, who met the three Nigerian-American women when they were unveiled as brand ambassadors for a local beer in Lagos, does hope that the team will bring more attention to female athletes in Nigeria, where sports news is dominated by men. Women have always been "a huge part of the success that the country has enjoyed in sports," so they need to be appreciated and given every support," he says. "Women have risen to the forefront of Nigerian sport despite being a traditional country where girls are expected to marry early in many cultures," he says. "We have a lot to do to encourage more girls to take up sport and ensure that they find self-fulfilment and empowerment." But when it comes to the government's promise to support the team, with a chief of mission named to take care of them, some Nigerians are ambivalent. The country is grappling with a struggling economy, threats from the radical Islamist group, Boko Haram and deadly clashes between cattle herders and farming communities that have killed at least 80 this year. "Spending our funds on this team is unnecessary," says journalism student Chike, who believes bobsled is "foreign and very expensive." "I would suggest that other sports that can be groomed in Nigeria should be given more attention." But Agi, the Abuja PR practitioner, disagrees. He feels the team is "worthy of celebration" because it was the first time Nigerian qualified for the Winter Games. "When you check the effort and determination of the team against all odds," he says, "you will agree that they deserve the attention." As for the team, their televised heats air Tuesday and Wednesday this week. And I'll tune in. To me, the story is inspirational — a clear testament to the Nigerian spirit. But I won't be getting on a bobsled any time soon. I don't have the guts yet to try it. And where's the ice? Linus Unah is a freelance journalist covering global health, conflict, agriculture, and technology in Nigeria. Find him @linusunah.